Hot off the press: four new SEAFDEC/AQD publications for sale. These, plus new flyers, an institutional video, and a compendium of SEAFDEC-developed technologies will be unveiled July 9th at Tigbauan, Iloilo during the book launching program. The four aquaculture extension manuals are: (1) the second edition of The biology of mud crabs Scylla spp. ET Quinitio and FDP Estepa; (2) Abalone hatchery by AC Fermin, MR dela Peña, RSJ Gapasin, MB Teruel, SMB Ursua, VC Encena II and NC Bayona; (3) Breeding and seed production of the Asian catfish Clarias macrocephalus by JDT Fermin, AC Fermin, RF Bombeo, AD Evangelista, MR Catacutan and CB Santiago; and (4) Grow-out culture of the Asian catfish Clarias macrocephalus by EB Coniza, MR Catacutan and JDT Fermin. 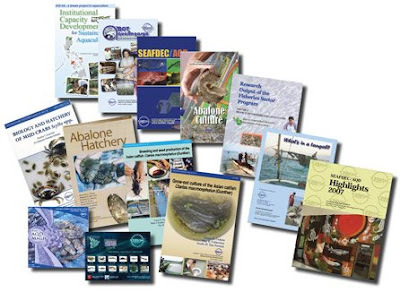 Also to be launched are the AQD Highlights (annual report); the AQD Magic video; the flyers for Abalone culture, ABOT AquaNegosyo, SEAFDEC/AQD and Institutional capacity Development for Sustainable Aquaculture (ICD-SA); the DVD compendium; and reports on the Research output of the Fisheries Sector Program and the Tangab fishing gear. The launching is one of the activities lined up for the 35th anniversary of SEAFDEC/AQD.